It was not the way things were supposed to go last Christmas Eve. 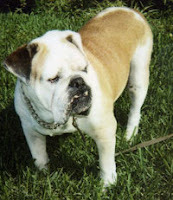 When my dear friend, Judy Ditfurth, took her Bulldog, Jeremy, to the vet, she had no idea he would not be coming home. There are no words to express how heartbreaking this unexpected loss has been f or Judy. But the loss has also been felt by Jeremy’s other friend in the Ditfurth household – their cat, Cinnamin. Cin and Jer were best friends, and in the weeks that followed Jeremy’s passing Judy often wrote about how lost Cinnamin was. Judy has been an animal lover all her life. 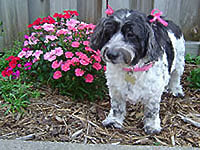 Over the years she made many donations to the Morris Animal Foundation in remembrance of her beloved critters. When she learned that the foundation had begun a Happy Healthy Cat Campaign, it seemed only fitting that a donation be made to that effort in Jeremy’s name, in honor of the special relationship he had shared with Cinnamin. Today is Judy’s birthday. I am sending heartfelt good wishes your way, my friend, and Jeremy and all the other angel critters who shared your life send barks and purrs…just to thank you for being such a good Mom.